Northwest Portugal conjures up images of verdant landscapes and terraced rows of plump, luscious grapes of the port wine-growing region in the Douro Valley. The capital of Lisbon evokes thoughts of iconic yellow tram cars rattling over the city’s seven hills, descending to the Tejo River and Atlantic Ocean—a bustling destination offering a multiplicity of cafés, restaurants, specialty bakeries, night spots, museums, and parks. 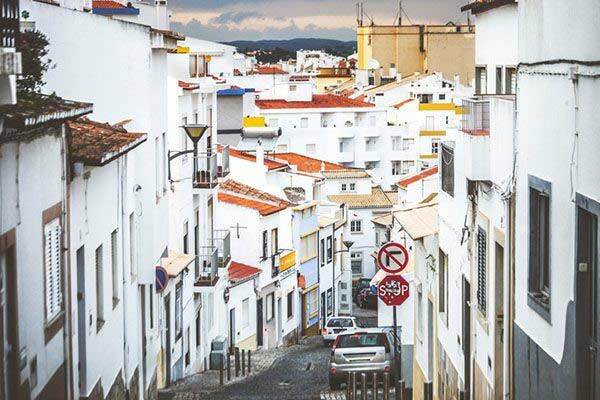 Regions like Trás-os-Montes in the northeast, Beira Interior, and the Alentejo hint at authentic Portugal, where cork-lined country roads stretch for miles, dividing fields of red, yellow, and purple wildflowers, and where you had better have a working knowledge of the native language to facilitate your daily life. But the Algarve? That’s a whole other story. Not long ago I received an email from a couple who attended our Bootcamp Conference in Santa Fe this past November. Nick and Lynne were considering expatriation, but weren’t sure which country to choose. They had narrowed it down to three, wisely planning to spend a month in each location to test the waters. Mexico was on the list, but only because of proximity to the States and the availability to easily visit family. One preference was Spain; the other, Portugal. The two chose the southern portion of the country, the Algarve, as their possible Portuguese retirement locale. This is where expats seeking both pure relaxation as well as sports enthusiasts of many stripes find their needs are met. In their email, the Greves asked if I could recommend specific cities in the region. Perfect timing, I wrote back, I’m about to write a piece on Lagos. Now it’s perfect timing for you, too. One of the most important components of a successful expatriation is, as they say, to know thyself. Ask yourself every question you can think of about your patterns, personality, goals, and tastes. Take your time with the answers. For example, do you want to see the shoreline when you sip your morning coffee? Or do you prefer a mountain vista? Maybe you’re a native New Yorker like I am, and living in the hear-a-pin-drop countryside would be unnerving. (It isn’t for me, by the way.) If so, perhaps you’d be better off in the capital, in the “second city” of Porto in the north, or in the centrally-located university town of Coimbra. Or one of those cities’ suburbs could offer the perfect balance for you. If you’re one who said yes to living near the ocean, there’s no better place to explore than the expat haven of Lagos. The town is blessed with a year-round moderate climate, with average temperatures ranging from 52 F in winter to 75 F in the summertime, when the normal average population of 22,000 swells with visitors from Europe and elsewhere. While landlubbers enjoy golfing, tennis, horseback riding, and hiking, the ocean offers the best of conditions for kayaking, paddle boarding, surfing, kite surfing, windsurfing and more in the area’s tourist-based economy. It’s easy to get around Lagos on foot. Much of the city is fairly flat, especially around the lovely marina, although you should always wear comfortable shoes for the cobbled streets and whatever hills you might encounter. Buses and taxis will also help you get around, and trains can take you to other regions of the Algarve and even up to Lisbon and beyond. About thirty minutes to the west of Lagos is the town of Sagres, famed for its historic connection to the Portuguese Age of Discovery. Head north from there and you’ll encounter the ruggedly beautiful Natural Park of Southwest Alentejo and Costa Vicentina. 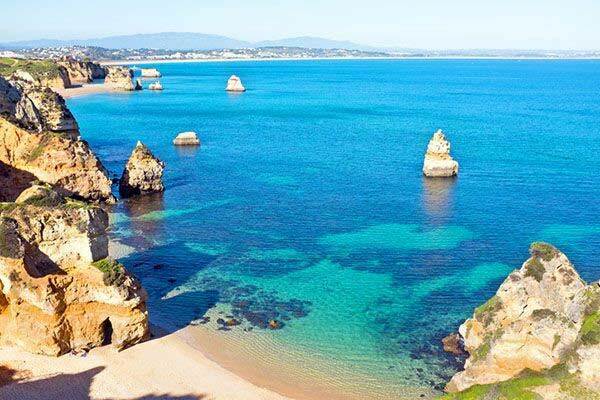 To the east, important cities include Albufeira which boasts a lively (there are 100 bars and restaurants in Old Town alone) nightlife, and Faro with its International Airport, just one hour from Lagos. 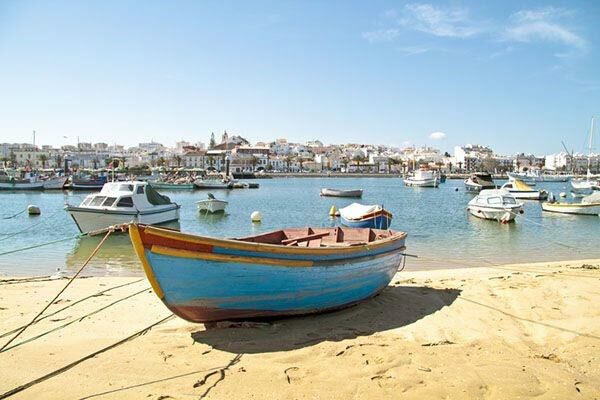 As you approach the Spanish border, you’ll discover Tavira, and Rio Formosa Natural Park. All these ingredients—a pleasant climate, lovely natural surroundings, dining and party venues, and easily available transportation—make Lagos an ideal choice for retirement. What would your life look like in Lagos? A typical day might begin with an early cup of coffee and warm custard tart known as pastel de nata, savored on your veranda overlooking the brilliant blue Atlantic, sparkling with sunshine. Then perhaps take the 6:58 bus to Loulé to visit the famed Moorish-inspired covered market. You’ll arrive by 8:15, still in time (the site opened at 6:00 a.m.) to pick up fresh dorado, salad greens, roasted peppers, and olives drenched in garlic and oil. Pack up your goodies in a freezer bag (or if you do have a car, a cooler) and take a moment to select some fresh-ground, organic coffee and a bottle of wine for dinner. Looking for home décor? You’ll find a wide variety of hand painted ceramics and lovely linens to add just the right touch to your retirement haven. Back home, stow your purchases in the kitchen and opt for a stroll through the historic district. Stop into an Irish pub for a snack and a brew, or shop for more home furnishings at a design store specializing in Indian imports. Or spend a relaxing afternoon on arguably one of the loveliest beaches in the region, the wide expanse of Meia da Praia. Whatever you choose, you’ll be ready and relaxed to prepare a dinner for friends among the expats you’ve met since arriving in town. Despite the tourist-oriented nature of Lagos, particularly during the peak season of July and August, prices are not as high as you might think. Here’s what you can expect in the way of expenses, based on a monthly average for two people.